A FATHER’S LOVE for his children is all powerful and the desire to protect is natural but can be all-consuming. Oklahoma native Steve Walker took his protective streak and turned it into a business idea…albeit a disquieting one. This week, he received much media coverage across the Atlantic for his bullet- and tornado-resistant blanket. He struck on the idea after a spate of lethal school shootings and tornadoes. A physician at Edmond and father of two elementary school students, Walker said he wanted to protect his sons from any dangerous classroom crisis. ““We wanted our children to have a layer of protection immediately,” he said of the blanket which uses the same material as army vestments in Afghanistan. He created the product with a team of inventors and ballistics experts over the past year. He envisages them being stored in classrooms and says they can be “easily applied” in seconds. Kids put them on just like a backpack with head-to-toe defense. Walker’s business partner Stan Schone admits that the bullet will still hurt but “it’s not going to kill you”. The men are also quick to point out that the blanket is not just a reaction to “deranged gunmen”. It also protects from flying tornado debris, they say. According to reports, the blanket costs about $1,000 but the company says it wants to work with corporations who would be willing to donate to schools. Here it is during a ballistics test. Equally terrifying. 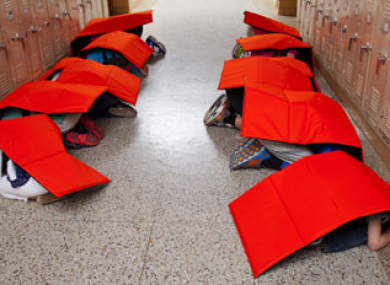 Email “An American company is now selling a bulletproof blanket to kids”. Feedback on “An American company is now selling a bulletproof blanket to kids”.